The North American tour of "The 101 Dalmatians Musical" is coming to Boston for a limited engagement, playing December 23 – 27 at the Citi Performing Arts Center Wang Theatre. Broadway leading lady and Drama Desk Award winner Rachel York heads the cast in the roll of the villainous Cruella de Vil. Based on the beloved book by Dodie Smith and led by an award-winning creative team including four-time Tony Award-winning director Jerry Zaks ("A Bronx Tale," "Smokey Joe’s Café," "Guys and Dolls"), acclaimed book writer/co-lyricist BT McNicholl ("Billy Elliot," "Spamalot," "The IT Girl"), and co-founder of the legendary rock band Styx, Dennis DeYoung, "The 101 Dalmatians Musical" promises a quirky, upside-down view of the world, where the audience is sees life from a dog’s point of view. As loyal fans know, the story follows Dalmatian spouses Pongo and Missis Pongo, living the good life in London with their “pets” Charles and Catherine Dearly. When their 10 puppies are suddenly “dognapped” by the villainous Cruella de Vil, they summon the help of a vast network of dogs and set off to rescue their pups. A happy ending is, of course, assured. Drama Desk Award winner Rachel York is best known for her critically acclaimed Broadway performances in "City of Angels," "Les Misérables," "Victor/Victoria" (Drama Desk Award) with Dame Julie Andrews, "The Scarlet Pimpernel," "Sly Fox" and "Dirty Rotten Scoundrels." York also turned heads with her portrayal of Lucille Ball in the CBS movie “Lucy.” Recently, she co-starred opposite Jeff Daniels in the world premiere of the new Broadway bound musical "Turn of the Century" at the Goodman Theatre in Chicago. Local audiences last saw her when she starred in "Hello, Dolly!" with The Reagle Players in Waltham. 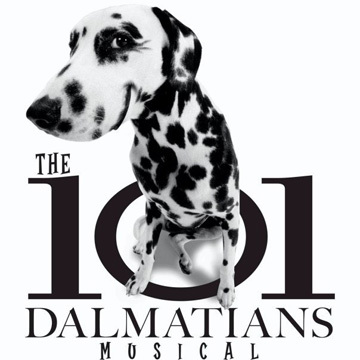 "The 101 Dalmatians Musical" will also showcase fifteen talented Dalmatians, most of whom were rescued from animal shelters across the country and given a new lease on life with this starring role -- making this a real rags to riches story. The show features a surprise grand finale showcasing the tremendous talents of the Dalmatians. All the dogs in the show were trained by one of the world’s foremost animal trainers, Joel Slaven, who has worked extensively with Jack Hanna on such features films as "Ace Ventura Pet Detective" and "That Darn Cat." The show’s producers have also created a special home for these extraordinary canines while on tour. The dogs travel in style in a one-of-a-kind customized bus being hailed as a “rolling doggie palace.” Equipped with a grooming station and portable playground along with two trainers, the Dalmatian will be treated like royalty. After the tour, the rescued dogs will continue to live a well-pampered life as they will be placed either in loving homes or will join Mr. Slaven on his sprawling Florida ranch. For tickets and information, stop by the Citi Center box office at 270 Tremont Street, call 866-348-9738 or visit www.citicenter.org.